The rise of Donald J. Trump may seem unprecedented, but we’ve seen this phenomenon before in the person of Robert H.W. Welch Jr., who founded the John Birch Society in 1958. Like Trump, Welch was a wealthy businessman. As vice president for sales at his brother’s confectionery company—which manufactured Junior Mints, Sugar Babies, and other popular brands—he understood the power of publicity. Selling candy and marketing politics had a lot in common. Like Trump, Welch was viewed as an unhinged rabble-rouser and a dangerous right-wing extremist. The media were fascinated and alarmed by him because he said such outrageous things: President Dwight Eisenhower was a communist who took his marching orders from his brother, Milton. Supreme Court Chief Justice Earl Warren should be impeached because he supported school desegregation. The United States should withdraw from the United Nations, which existed to undermine US sovereignty. Fluoridation of water supplies was a communist plot. The Society, which still exists, was named for a missionary-turned-soldier who was shot and killed by Communists in China at the end of World War II. Welch linked the martyrdom of the young John Birch to the subsequent “loss” of China to Mao’s Red Army. The cover-up of Birch’s death was evidence of treason within the Truman administration. Also like Trump, Welch claimed that conspiratorial forces threatened the United States, undermining its strength and sapping its will. Political elites were “insiders” working against America’s interests. They were either conscious agents or dupes being manipulated by subversive powers. If the government said something, the truth must be the opposite. The failed 1961 US invasion of Cuba was a phony assault to consolidate Castro’s alliance with the Soviets. Support for non-communist forces in South Vietnam actually disguised a plan to assist a communist takeover. In today’s world, Welch would have understood globalization as a sinister scheme, and China and Islam as existential threats. President Trump’s politics draw on Robert Welch’s playbook. Welch was maligned by liberals, denounced by conservatives, and dismissed by the mainstream media. Yet tens of thousands of Americans—mostly white, middle-class, suburban and many of them women—became loyal members. They didn’t necessarily agree with everything Robert Welch said, but they believed his basic message was important. They were concerned about the erosion of traditional values; the advance of socialism and communism; the overreach of government; runaway taxes and the national debt. Although Welch was not running for political office, he gave these citizens a voice. President Trump’s politics draw on Robert Welch’s playbook. Trump has tapped into alienation and anxiety about rapid social change. He uses conspiracy theories and bogus information to provoke and disrupt. His supporters, who harbor a distrust for government and fear of foreign entanglements, are willing to look beyond his inflammatory rhetoric. And like members of the Birch Society, they believe that their individual rights are threatened, the federal government needs to be curtailed, and international agreements cannot be trusted. The John Birch Society, which marked the beginning of our divided politics in modern times, faded from public view by the late 1960s. But with Trump’s electoral success, what was once considered a fringe movement has moved to the center. Mr. Welch, who died in 1985, would have celebrated Trumpism as the victory of Birchism. Whether the revival of his tactics and ideas will “make America great again” remains to be seen. 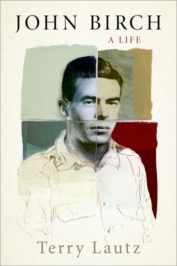 Terry Lautz is the author of John Birch: A Life (Oxford University Press, 2016). Overall I think this article is fair, but I think it leaves a false impression in readers’ minds, if only unintentionally. The JBS did advocate Earl Warren’s impeachment, but not because he wanted to desegregate schools, but because he was willing to trample the Constitution and the Tenth Amendment.